Slated on January 24-26, at the World Trade Center Manila, ProPak Philippines will be the first-of-its-kind food, drink, and pharmaceutical-focused international trade exhibition in the country, in response to the rapidly expanding processing & packaging industries, and the government initiatives to encourage the growth of local industries. "We are launching ProPak Philippines to a backdrop of a very strong industry and strong government objectives and initiatives to drive it forward. We are very pleased that we have all of this strong support to support this first step into the Philippine market,”states Justin Pau, general manager of UBM Asia (Thailand) and project head of ProPak Philippines. ProPak Philippines will host more than a hundred local and international exhibitors representing the manufacturing and packaging sectors, including food processing, quality control, machinery and automation, bottling, brewing, waste management, food safety, and many more. In 2017, the National Economic Development Authority (NEDA) launched the Philippine Development Plan (PDP) 2017-2021 as part of the AmBisyon Natin 2040 socioeconomic agenda. The PDP cited export objectives, including increasing the growth and competitiveness of exporters through development, and the diversification of export products and markets, as priority areas. With about 6000 expected attendees from various sectors, ProPak Philippines aims to be a conduit for business owners, manufacturers and retailers to extend the reach of their products and services through packaging technologies. 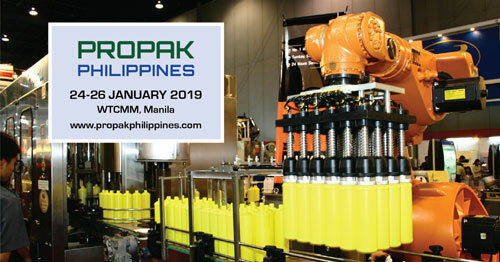 Apart from the exhibits, ProPak Philippines will also feature seminars where the latest industry developments, trends and techniques in supply chain management and innovation, food, drink, and pharmaceutical processing and packaging methods will be presented. There will also be networking and business opportunities. ProPak Philippines is supported by the Department of Trade and Industry, the Packaging Institute of the Philippines, the Dairy Confederation of the Philippines, the Production Management Association of the Philippines, the Philippine Printing Technical Foundation, the Association of Laguna Food Processors Inc., the Philippine Association of Food Technologists Inc., and other allied industries and associations. ProPak Philippines is organized by UBM, which, in June 2018 combined with Informa PLC to become a leading B2B information services group and the largest B2B Events organizer in the world. Please visit www.ubm.com/asia for more information about our presence in Asia.